Life Is Strange 2 will flee its predecessor’s high school setting, opting for a brand new tale about brothers on the run. The game will star Sean and Daniel Diaz, who you may recall from The Awesome Adventures of Captain Spirit. When the pair inadvertently murder a police officer, they find themselves with no option but to flee Seattle for their family’s hometown of Puerto Lobos, Mexico. You’ll be making the journey alongside them. There’ll be a new power which developer DONTNOD is keeping underwraps, but our guess is some kind of telekinesis. French composer Jonathan Morali will once again score the game, while a new licensed soundtrack will also be on hand to inject added emotion into key scenes. The first gameplay footage will debut at Gamescom 2018 this week, with the inaugural episode due out on 27th September. We’re not sure what to think yet. I'm glad it's not Avengers with kids (yet!) but I almost wished I did feel disgust because this did nothing for me at all. To be honest I would prefer if there were no superpowers kind like Before the Storm. & here I'm thinking max and chole was going to be in the sequel..
@belmont I'm so glad I'm not the only one. I hate the sci-fi stuff. I prefer if their wasn't any superpowers, kind of makes look like it's trying to justify itself as a "game" rather then take the more grounded and believable approach Before The Storm had. I was always kind of meh towards it anyway since it wasn't continuing Max & Chloe's story in the first place. Shame that gets left to a comic book instead of having Deck 9 make it. I'm soooo in. This seems much better than the first one. ...despite everything else looking somewhat familiar. Story is king in these kinds of games, though. It'll live or die on how relatable, charming and accessible the Diaz brothers are. On first pass, I may have an easier time with them than I did Max, Chloe and Rachel. You can't continue with the same characters forever, and I really never identified with any of them, no matter what Dontnod's PR department might say. I'm pleased about the changes they have made, and I'll be wary of the ones they haven't. Roll on September. @belmont @get2sammyb yeah me too. I love the down to earth stuff. The tough human choices and the deep character development. Leave the super powers to the million other games that have it, and nurture what is unique about this series. Hmm, interesting trailer. I'm not blown away, to be honest - maybe the gameplay will be more convincing. If you played the first one or the telltale series then you'll know is like a 3D visual novel. Yeah I'm kind of disappointed by this trailer. What interested me with the first game was the whole school setting and the vast cast of characters. This looks more like something out of The Walking Dead TellTale series, which is highly disappointing. But we'll see I guess. So, who are these two in relation to Captain Spirit? I thought this was gonna continue Chris' story from that? I'm glad they're not dragging out Max & Chloe's story. That feels finished to me. A while ago someone told me it's gonna be about the neighbors from Captain Spirit. It seemed super random back then and it still does. Gonna wait for the full season. @Alfieburns Sean Diaz is the kid next door who "saw" Chris fall right at the end. Puts many an assumption about Chris into perspective. @RogerRoger oh dear, I literally only just understood that ending just now! I assumed Chris stopped himself and the kid next door was just watching him. I feel like an idiot! @Alfieburns The next door neighbours. 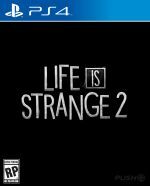 I loved the 2 games Life is strange and Life is strange before the storm but this sounds like something I will pass on until I can buy it Dirt cheap! Sorry! I always depend on push square for reviews so I will be watching. Thanks! I have faith that it will turn out as a very decent game (at worse). As much as i love the characters from lis1 and bts i feel their story has been told though i do hope that ONE DAY we meet chloe again. @Alfieburns Don't worry, it's what the ending was designed to make you think. Classic misdirection. I liked the trailer, this is gonna be a good game!